We redesigned the ForeFlight Mobile interface on the iPhone to more closely match the iPad, and that new interface is available now to all customers with ForeFlight version 9.5. Also in this release, your preflight Graphical Briefing automatically syncs across devices, view and select your destination FBO in the Flights view, ForeFlight Military Flight Bag (MFB) customers can download and view the worldwide DOD library of tactical mission planning charts, and more. The biggest thing you’ll notice about the new iPhone interface is the Tab Bar at the bottom of the screen, which replaces the “Menu” button as the primary means of navigating around the app. Tab Bar navigation makes it much easier to move between different views in the app. And with the new Flights view on iPhone, you can plan, brief, and file flight plans faster than ever before. The iPad has some notable changes as well. Favorite and Recent buttons throughout the app are consolidated under a single button and a new “slim” tab bar design increases usable screen space. Finally, we redesigned the More view to group the tabs on the left into more logical sections. We moved frequently used features like Logbook and Checklist to the top and administration functions like Downloads, Account, and Settings to the bottom. ForeFlight MFB (the version of ForeFlight built for US government, military, and DOD aviation) is now the first and only mobile solution where authorized and authenticated customers can download and display the worldwide library of US Department of Defense military mission planning charts, including Joint Operations Graphics (JOG), Tactical Pilot Charts (TPC), Operational Navigation Charts (ONC), and Range charts. A new interactive Graphical Chart Manager makes it fast and easy to select and download only the desired charts from the thousands available in the library. The charts use the newest format standard in military digital chart technology, developed by the National Geospatial-Intelligence Agency, called Enhanced Compression Raster Graphics (ECRG). The ECRG format combined with ForeFlight’s compression process technology results in faster over-the-air (wireless) downloads, less used storage space, higher resolution, and quicker load times. All four mission planning chart types are geo-referenced and support display of ownship position, the overlay of weather and hazard information, and seamlessly integrate with all of ForeFlight’s innovative map features. A new section in the Flights view planning form allows you to select an FBO at your destination airport, making helpful functions and information easily accessible while planning and viewing your flight. The Destination Services tab opens the familiar ForeFlight Directory list where you can compare all the FBOs at an airport and view additional details like services, photos, comments, and fuel prices. Once you select an FBO, new buttons appear on the planning form to call or email the FBO, find its location in the Apple Maps app, or view its details. ForeFlight also remembers your selection at every airport where you choose an FBO and automatically selects the same FBO the next time you plan a flight to that airport, saving you time and making useful functions quickly accessible. ForeFlight’s Sync platform now includes preflight Briefings, making critical weather information and NOTAMs quickly accessible on iPad, iPhone, and the web. As soon as you retrieve a briefing, ForeFlight makes it instantly available for viewing on any of your other signed-in devices. In addition, Briefings are now created automatically for every filed flight plan and stored permanently in the ForeFlight Cloud. Graphical Briefing now includes graphical area forecasts (replacing the legacy text-based area forecasts for CONUS regions). The new imagery for cloud cover, visibility, surface winds, and precipitation help you make better, faster analysis of the weather along your route. Tap on any graphic in the briefing to view it in full screen, then zoom in and pan for a better view of the details. A small but powerful enhancement, you can now tap on any leg in an active route on the Maps view to see information about it and take a number of actions. The popup includes values for leg distance, magnetic course heading, and MEA and MOCA information if the leg is part of an airway. You can also use the buttons to delete the waypoint at the end of the leg, fly direct to that waypoint, or “Fly Leg”. Tap Fly Leg to activate that leg in the Navlog, which is helpful if you need to manually advance to the next leg. ForeFlight looks stunning on the iPhone X’s high-resolution edge-to-edge screen, with text and colors appearing sharp, smooth, and vivid. 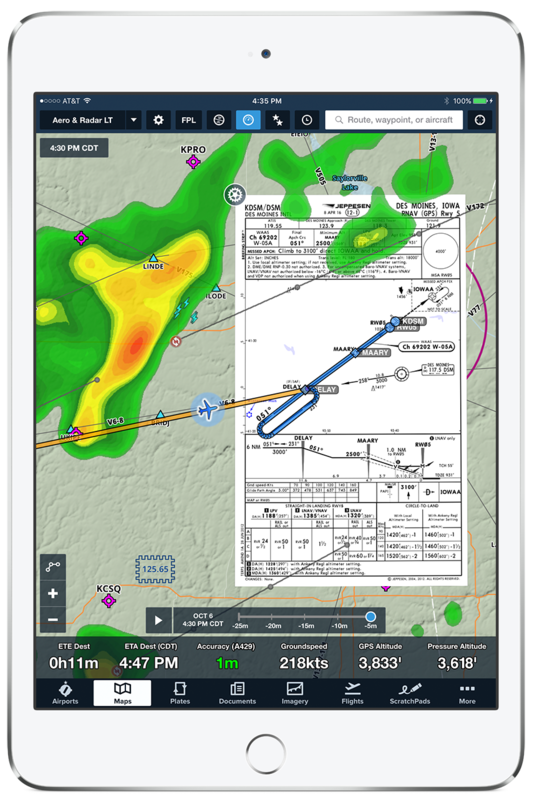 On the 10.5-inch iPad Pro, which has a slightly larger screen than 9.7-inch iPad models, ForeFlight now takes advantage of the screen’s full resolution to maximize every app view. ForeFlight customers now have access to more winds aloft data for more accurate long term flight planning. The winds aloft forecast data in ForeFlight now extends up to seven days in the future (previously 30 hours), giving you more accurate route performance calculations for flight plans within that timeframe, anywhere in the world. The additional high-resolution Global Forecast System (GFS) data is available now for all ForeFlight customers and is automatically incorporated into route performance calculations. When your flight is more than seven days away, ForeFlight now gives you the advantage of historical winds aloft data. Historical winds are derived from monthly average winds over the past 40 years. This means that when you plan a flight that uses historical winds, ForeFlight assumes the same wind speed, direction, and temperature for every day and time within a given month; move the departure time to a different month and ForeFlight automatically adjusts the value based on the average for that month. You’ll know when ForeFlight is using historical winds by the yellow banner across the top of the Flights view. It is worth noting here that, unlike the seven day wind forecast, currently only the Flights view uses historical winds. When planning in the Maps view, ForeFlight will assume zero winds if you’re planning a flight more than seven days in advance. However, you can easily send your route plan from the Flight Plan Editor in the Maps view to the Flights view and ForeFlight will automatically re-calculate route performance using historical winds. In addition, ForeFlight on the web uses historical winds for flight planning beyond seven days in the future. Use the Send To button to move your route plan from Maps to Flights. 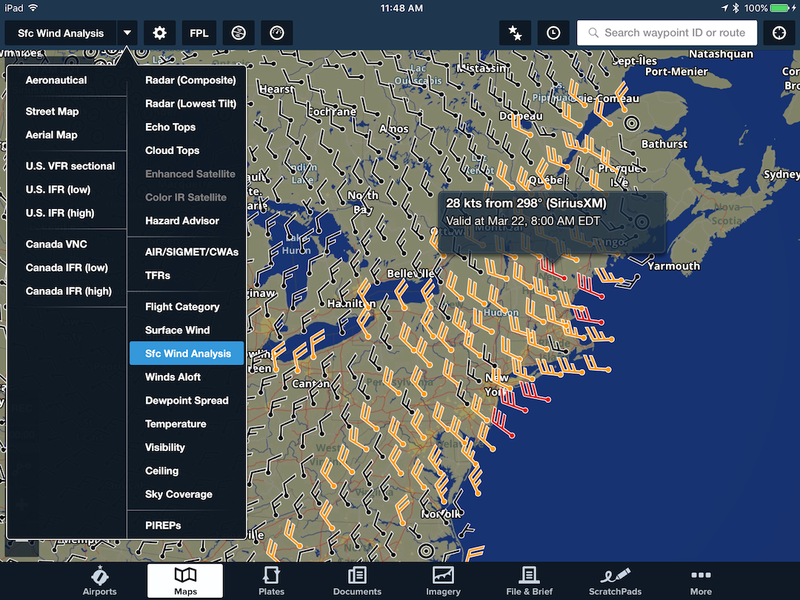 Seamlessly integrating the GFS seven day wind forecast and monthly historical winds provides ForeFlight customers with more accurate data for planning a flight, whether it’s next week, next month, or next year. Miami ARTCC and Havana ACC have cooperated to revise the existing routes between Florida and Cuba in an effort to improve efficiency and safety. The most significant change is the removal of the G448 airway, which until now has been the primary route between Miami ARTCC and Havana ACC. 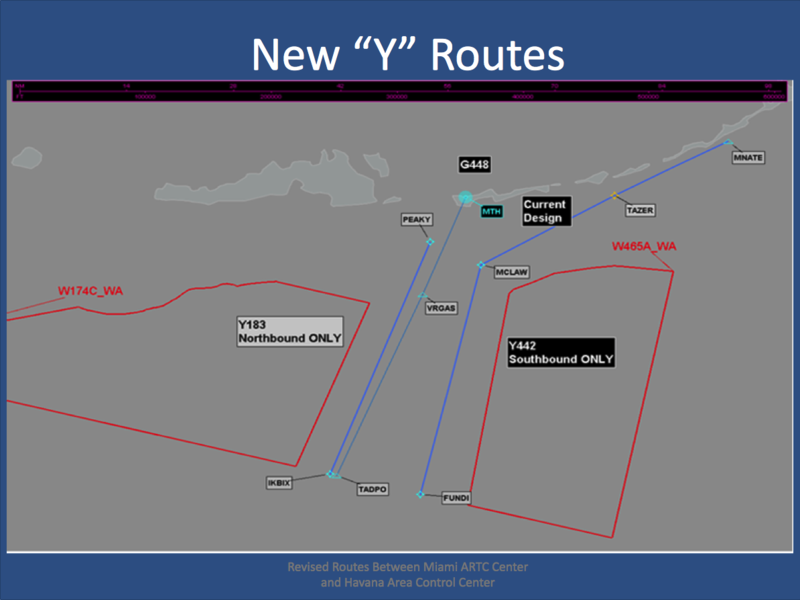 Replacing it are two RNAV airways: Y442 (southbound only) and Y183 (northbound only). Accompanying these changes are modifications to overflight routes and existing Cuba SIDs and STARs. If you frequently fly this corridor or plan to in the future, we recommend you download and review the full presentation from Miami ARTCC (linked here) to familiarize yourself with the changes, which went into effect at 0400Z on October 12, 2017. The FAA is publishing ten new RNAV STARs for the Atlanta Metroplex, eight for KATL and two for nearby satellite airports, to replace existing procedures. All ten of the new STARs will appear in ForeFlight as part of the October 12 chart data cycle, however, the eight KATL STARs will not become active until the 17th. Attempting to file with those procedures before the 17th will likely result in a rejection from ATC, so you should wait until after the 17th to file them as part of a flight plan. You can begin filing with the two satellite STARs on the October 12 effective date. ForeFlight and Satcom Direct (SD), the business aviation connectivity provider, announced today a new integrated data solution for joint Satcom Direct Router (SDR®) and ForeFlight Performance customers. Customers can now use the SDR as a GPS data source to accurately depict aircraft “ownship” position on ForeFlight’s dynamic moving map display without the need for additional GPS hardware. With GPS location, ground speed, and indicated altitude information, passengers and crew flying with their iPad or iPhone can track the flight’s progress on the map, and see real-time information like time to destination, distance to destination, and local time of arrival. When connected to the SDR’s Wi-Fi internet, ForeFlight customers can also receive and display high-resolution radar, icing, turbulence, winds aloft, and over a dozen other graphical weather layers. With access to all the latest weather, pilots can quickly and accurately change flight plans while in the air. “We are excited to work with Satcom Direct and we look forward to future features that unlock more value from on-board connectivity,” said Tyson Weihs, ForeFlight’s co-founder and CEO. The SDR is a business aviation connectivity platform that allows customers to connect to on-board systems, make and receive calls, text, email, connect to the internet and stream data on the ground or in the air, anywhere in the world. The router automatically senses and selects the best connection available, either satellite network or 3G cellular, and uses cutting-edge technology to compress and cache data, ensuring the most efficient and cost effective transmission of information. 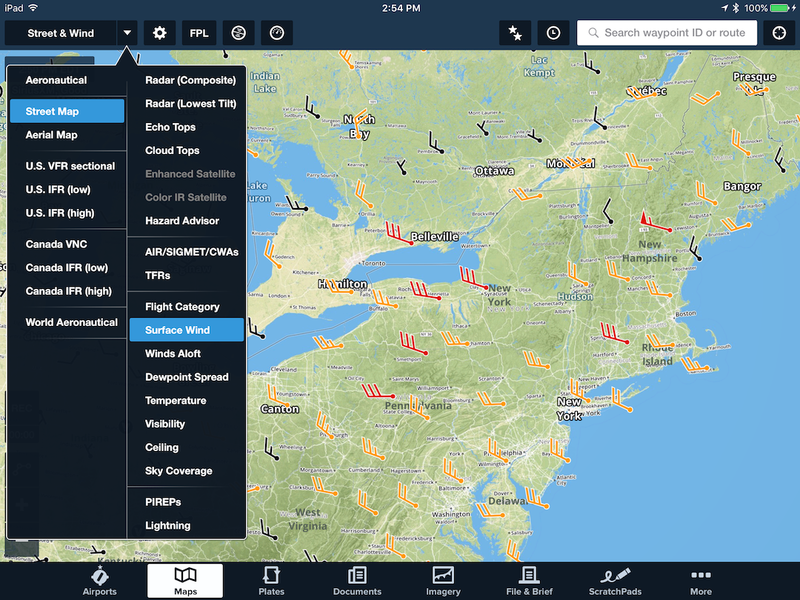 ForeFlight gives pilots everything they need to plan, file, and fly the safest, most efficient route, including up-to-the-minute weather, airport and FBO information, advanced terrain and obstacle visualization, and automatic safety alerts. The current SDR integration is available to ForeFlight customers on Performance Plus and Business Performance plans. Jeppesen’s global, data-driven enroute charts are now available in ForeFlight for all customers who have purchased or linked a Jeppesen chart subscription. The global dataset of IFR High, IFR Low, and VFR enroute charts are available as a single download, at no additional cost and with no setup or configuration required. Jeppesen enroute charts are dynamic, responsive, full paper-replacement capable, and seamlessly integrated into the ForeFlight app. Because the charts render using data-driven technology, you have the flexibility to customize what aeronautical data to show or hide on each map type or choose between a light and dark theme. Similar to ForeFlight’s data-driven Aeronautical Maps, the Jeppesen charts also automatically change what information is shown based on zoom level and the ‘always-up’ label capability rotates text and information to make it easier to read the map in any orientation. And just like any other chart layer in ForeFlight, you can overlay weather, hazard, fuel, and custom content layers, as well as geo-referenced terminal charts and airport diagrams if you have a Pro subscription or above. 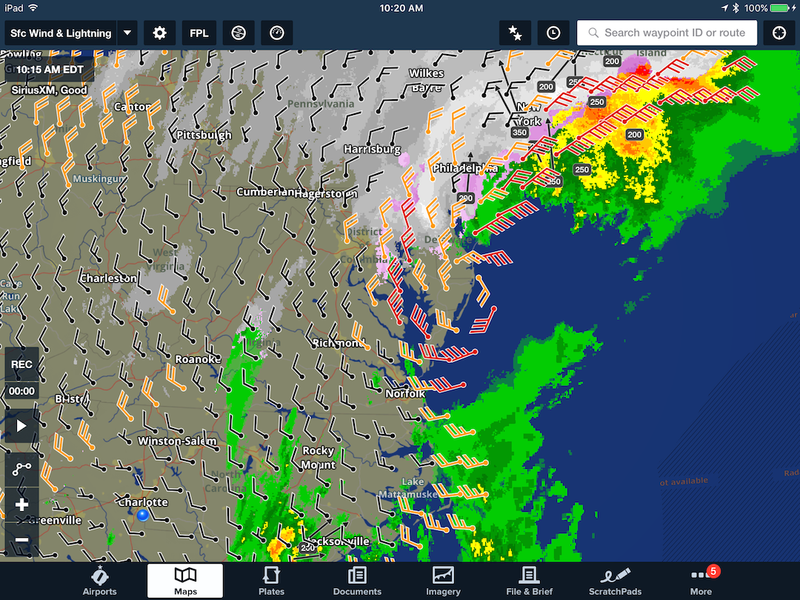 ForeFlight’s industry-leading weather visualization capabilities are now better than ever. Five new dynamic Map layers graphically depict global icing, turbulence, and surface analysis forecasts, giving you the tools you need for more informed flight planning. Check out this article for a deeper dive into these new weather features. The Icing and Turbulence layers each have U.S. and global options, while the Surface Analysis layer provides global isobar and pressure forecasts with detailed weather features for the U.S.
Each layer has a Time Slider to loop animation or manually rock back and forth between forecast frames. The Icing and Turbulence layers allow you to quickly scrub through the available altitudes using the Altitude Slider. In addition, these layers are included in the weather data downloaded with Pack so you can view offline. For the cross-platform planners out there, all the new weather layers are available in ForeFlight Mobile and on the web. We are introducing these five new forecast-based graphical weather Map layers to customers on Pro Plus, Performance Plus, and Business Performance plans. Multi-pilot accounts are now easier to manage using the new Aircraft Manager. This capability enables account administrators to set up their ForeFlight account faster and ensure every pilot has access to the aircraft profiles they need for more accurate and consistent flight planning. For ongoing account maintenance, updating pilot iPads when there are fleet changes is easier than ever. Using ForeFlight’s web application, account administrators can create and “publish” company aircraft profiles, including performance data and ICAO filing codes, to all pilots on the account, who can then use the shared aircraft for flight planning. This feature is available in the Business Performance plan. For Performance Plus and Business Performance subscribers, ForeFlight’s detailed Navlog now includes RAIM prediction to alert pilots if GPS outages are expected along the route. The alert indicates the affected portion of the flight (departure, destination, or enroute) so pilots can modify the flight plan accordingly prior to filing. RAIM service coverage currently includes flights within Continental US, Alaska, and Hawaii. The airport fields at the top of the Flights view now sport the same “Smart Search” capability that we previously introduced for Logbook. Start typing to see suggestions based on airport names, city names, and airport identifiers, as well as your recent and favorite airports. The recently-introduced Route Preview map on Flights also now shows composite radar overlaid on the map, and allows you to enter an interactive “split-screen” mode by tapping on it. For the most accurate flight logging, ForeFlight Logbook now has the option to use Time Out/Off/On/In fields. These fields are standard for most professional pilots and operators flying larger aircraft, and allows you to easily capture crew block time and aircraft air time. You can show or hide these fields on flight entry forms using a single toggle switch in the Logbook Settings menu. If you fly with Avidyne’s IFD 550 FMS you can now receive AHRS pitch and roll data in ForeFlight to power the built-in attitude indicator. Combine this with Synthetic Vision (available with Pro Plus and Performance Plus subscription plans) for a powerful backup attitude and terrain awareness solution. Performance Plus and Business Performance customers flying with the inflight Wi-Fi Satcom Direct Router (SDR) can now receive GPS and indicated altitude data for display in ForeFlight Mobile. The SDR connection can also deliver internet-based weather and enable other ForeFlight features that require internet connection. ForeFlight uses GPS latitude and longitude and ground speed to display your aircraft ownship position, and barometric altitude from the router to power the Pressure Altitude instrument (which is now a separate instrument from the Cabin Pressure). Customers flying with uAvionix’s SkyEcho and EchoUAT ADS-B transceivers can now connect to them via Wi-Fi to receive inflight data in ForeFlight. SkyEcho provides dual-band ADS-B weather and traffic in ForeFlight for pilots flying in the U.K. EchoUAT provides dual-band ADS-B weather and traffic and GPS position in ForeFlight for light sport and experimental aircraft that have the device installed. Learn more about uAvionix. ForeFlight Mobile version 9.3 is now available on the App Store. The Route Advisor tool now gives you a visual preview of all route options on an interactive map. Tap through the list to highlight each route on the map, then tap “Select Route” to add it to your flight plan. Simple and easy. The interactive Route Preview map also appears in the Flights view form-based planner to provide a quick visual reference of your route. Your departure and destination airports are shown overlaid on a simple basemap. ForeFlight’s performance planning now supports step-climbs. The flight planning engine calculates the highest possible initial altitude, then automatically creates step-climb legs as the aircraft weight decreases. Step-climb information is detailed in the printable Navlog, accessible from the Flights view by tapping the Navlog button. The step climb leg information is available in Performance Plus, Business Performance, and MFB Performance plans.Learn more about ForeFlight Performance planning. After filing your flight plan in ForeFlight, you will receive a push notification to your device when ATC issues a revised expected route and when adverse weather conditions arise that may affect your flight. Access weather alerts in the Messages tab in the Flights view. Flight Notifications are available to customers on all ForeFlight plan levels who file flight plans via ForeFlight. The “Add Next Flight” button in the Flights view makes it faster and easier to plan multi-leg flights by carrying forward departure, aircraft details, payload, fuel policy, and more. In addition, you can now export your flight plan in the official ICAO format and print, email, share via AirDrop, or save a copy in ForeFlight Documents. The ForeFlight map engine has a significantly upgraded basemap, which now renders more quickly, smoothly, and with sharper depiction of features such as major roads, railways, national parks, and state and national boundaries. In the Map Settings menu, choose from multiple terrain presentations: Colored, Shaded, or None. Shaded Terrain uses grayscale shading to depict terrain, providing the same level of detail as the colored terrain option with less visual distraction. Enter a tail number, aircraft call sign, or commercial flight number into the Maps view search box to see recently filed flight plans. ForeFlight displays filed flight plans for aircraft that are either currently enroute or depart in the next 24 hours. Simply tap on a result to load the route into the Flight Plan Editor. Great for commercial pilots who want to quickly load an upcoming flight, or for passengers who want to follow along in the air! A new interactive Time Slider control provides frame-by-frame control over playback of Radar and Satellite weather layers. Use the familiar play button to automatically play through each frame. To manually control playback, tap-hold on the Time Slider and drag left or right to move between frames, or tap on the line to the left or right of the slider marker to advance it one frame at a time in either direction. For customers flying with the SiriusXM SXAR1 aviation receiver, you will now see Icing, Turbulence, and Surface Analysis layers as part of your SiriusXM Pilot for ForeFlight subscription. For a fast analysis of Icing and Turbulence conditions at each altitude, you can quickly scrub between altitudes using the Altitude Slider in the lower right corner of the Maps view. In addition, the Icing layer is enhanced with small red dots to indicate dangerous regions of supercooled large droplets. Refer to the Pilot’s Guide or the ForeFlight Mobile Legends Guide for more details on interpreting these new weather layers. Like the new “Add Next Flight” capability for the Flights view, the “Add Next Entry” button in Logbook allows you to quickly add a follow-up entry for any existing flight in your logbook. The new entry uses the same aircraft as the previous flight, and auto-fills the departure airport and Hobbs/Tach time based on the details of the previous flight. The button is available at the bottom of every flight entry. ForeFlight 9.1, now available on the App Store, introduces our next-generation high-performance flight planning, a new Flights interface that replaces the File & Brief view and streamlines the flight planning and filing workflow, Jeppesen’s global high-resolution terrain and obstacle data for everyone, and more. ForeFlight Performance is a new tier of service that provides best-in-class flight planning and global wind-optimized autorouting capabilities for high-performance aircraft. ForeFlight Performance includes a library of aircraft with performance profiles to calculate accurate flight time and fuel burn, a sophisticated flight planning engine that generates global wind-optimized routes, and a user-friendly interface that simplifies the planning workflow. The core of ForeFlight’s new performance planning capabilities consists of an extensive library of aircraft with detailed performance profiles, a sophisticated global routing engine powered by ForeFlight’s AviationCloud technology, and redesigned map and form-based flight planning interfaces designed for maximum efficiency. ForeFlight’s in-house performance team built the aircraft performance profiles from the manufacturer’s climb, cruise, and descent performance data. The performance models are defined for multiple altitudes, weights, and temperatures, allowing the planning engine to produce highly accurate speed and fuel flow data for all conditions. ForeFlight’s library includes hundreds of profiles for the most popular piston and turbine aircraft from Bombardier, Cessna, Cirrus, Daher-Socata, Dassault, Embraer, Gulfstream, Hawker-Beechcraft, Pilatus, Piper, and more. Setting up an aircraft in ForeFlight with performance profiles can be done in less than a minute. Simply search for and select your aircraft model, confirm the basic weight and fuel data, and add a tail number. This saves you time as all of the complex performance data and multiple cruise profiles from the aircraft manual are pre-built and automatically loaded for you with a click on the web or a tap on the iPad. You will also see a newly designed Flights view that replaces the File & Brief view. Flights simplifies and consolidates the planning workflow into a single form-based view. In addition to route information, the new planning form has neatly-organized sections for payload and fuel planning. ForeFlight automatically runs structural weight limit checks with every adjustment to the plan and provides visual alerts when an issue is detected, helping to eliminate an overweight takeoff or landing scenario. ForeFlight Performance gives you the ability to select from multiple fuel policies, allowing the flexibility to calculate block fuel using a desired fuel strategy, a capability especially important for flight departments that have specific fuel policies pilots must follow. For example, if an operator requires that the aircraft complete a flight with 2000 pounds of fuel, then selecting the Landing Fuel Policy quickly calculates the block fuel amount to load for that desired outcome. The form-based workflow of the Flights view integrates Route Advisor and Altitude Advisor, two powerful decision-making tools previously accessed only on the Maps view. Powered by the AviationCloud advanced flight planning engine, Route Advisor analyzes current and forecasted wind and temperature data, aircraft performance capabilities, and recently cleared routes to generate a comprehensive list of valid wind-optimized route options for any two airports in the world, even for airports without previously flown or preferred routes. ForeFlight calculates performance results for each route and displays the estimated flight time, distance, and fuel burn alongside each route string allowing for quick comparisons between different routes. The AviationCloud autoroute tops the list and typically offers the most optimal route based on the current data. Recently-cleared ATC routes are listed next, showing the departure time of the most recent flight cleared for that route (which will often be in the future for frequently filed routes), the number of times that route was cleared by ATC in the past year, and the type of aircraft and altitude range for which the route was cleared. These details give pilots added confidence in the expectation for a smooth clearance delivery experience. ForeFlight developers anticipated real-world scenarios to help guide the product design and feature set. Pilots are often confronted with the need to explore the impact of taking more or less fuel, last minute aircraft changes due to maintenance, or a situation where more passengers than expected arrive at the airport. ForeFlight Performance enables pilots to quickly evaluate what-if scenarios with just a few taps. If any adjustments are made in the fuel and payload fields or a different aircraft is selected, ForeFlight automatically recalculates weight, altitude, and fuel requirements in a matter of seconds. In addition, the planning engine works offline as well, giving pilots the flexibility to recompute a route even when they are out of range of an internet connection. The Flights interface also features easy access to a detailed printable navlog for inflight reference, a link to a comprehensive briefing, and a tab for messages from ATC and other notifications pertaining to the flight. Once planning is complete, it’s a single tap to the filing form, which is nearly complete based on the information already provided. The user-friendly interface extends from ForeFlight Mobile to the web where the Flights tab on the web not only mirrors the functionality and workflow of the mobile app, but also displays an adjacent map of the route that stays in perfect sync with any changes made to the form. ForeFlight Sync ensures that all planning activity automatically syncs between mobile devices and the web. ForeFlight Performance will help save pilots time and fuel not only through higher fidelity performance data and advanced route optimization. The Performance tier also integrates JetFuelX contract fuel prices directly into the app. JetFuelX is a web-based service that helps customers quickly determine which locations on and around their route of flight are offering the best prices based on their personal contracted rates. With JetFuelX prices displayed on the map, subscribers to ForeFlight Performance can easily compare prices from multiple fuel card memberships and pinpoint the best fuel stop location. Anyone can sign up for a free JetFuelX account at jetfuelx.com and immediately start saving on jet fuel purchases. The new high-performance planning features are part of ForeFlight’s two new subscription plans: Performance Plus for individuals and Business Performance for multi-pilot flight departments. The single user Performance Plus Plan is priced at $299.99 USD per year and the multi-user Business Performance Plan starts at $300 per year per license. For plan comparisons, visit foreflight.com/pricing. Take a deeper look at all of ForeFlight’s advanced performance capabilities by exploring our Performance planning video series. All customers will see a newly designed Flights view that replaces the File & Brief view and simplifies the flight planning workflow into a single neatly-organized, form-based page. You can build your route, file the flight plan, generate a graphical weather briefing, and print a detailed navlog to reference during flight. Customers with Pro and Pro Plus plans will also receive flight notification messages here. Flights includes buttons for Route Advisor and Altitude Advisor, two powerful decision-making tools previously accessed only on the Maps Route Editor view. The new flight plan summary strip pinned to the top of the Flights view keeps route distance, flight time, fuel burn, and route wind component information front and center. The Flights interface extends from ForeFlight Mobile to the web where the Flights tab on the web mirrors the functionality and workflow of the mobile app. Planning activity automatically syncs between mobile devices and the web. From the Flights view, tap on the new Navlog button to generate and print or email a detailed Navlog that includes flight and fuel summary information, TOC, TOD, synthetic waypoints along track, a wind and temperature aloft table for quick reference, and more. Printable navlog is available for all customers. Earlier this month we announced our strategic alliance with Jeppesen. The first phase of this partnership introduces the integration of Jeppesen’s global high-resolution terrain and obstacle data into ForeFlight Mobile. This data now comes standard in every ForeFlight plan, making ForeFlight’s powerful mobile hazard awareness technology better than ever. For customers with Hazard Advisor map overlay, Profile view, and Synthetic Vision, you can now use these features anywhere in the world at no additional cost. Jeppesen’s global library of departure, arrival, and approach procedures are coming to ForeFlight Mobile later this Summer. We’ve streamlined the process to import User Map Layers (previously User Map Shapes) for viewing in ForeFlight. In addition to drag-and-drop via iTunes, you can now easily import your custom KML files from a hyperlink, email attachment, or AirDrop. Build and share shapefiles with your flying club or flight crew. To import KML files, tap-hold on an email attachment or hyperlink and sele ct “Copy to ForeFlight” from the menu. It’s also easier than ever to access your imported content in ForeFlight. In addition to the Maps view layer selector, quickly access and manage your custom User Map Layers and User Waypoints files in the new User Content tab in the More view. Visit https://foreflight.com/support/user-map-shapes/ to learn more about User Map Layers. Two-way flight plan transfer is now available with Avidyne’s IFD550/540/440 systems. Display ADS-B METARs, TAFs, and PIREPs in ForeFlight Mobile when connected to a Garmin Flight Stream 510. For more information about ForeFlight’s avionics connectivity visit foreflight.com/connect. ForeFlight’s Radar layer now covers Europe, Australia, and Japan – adding to our expanding global weather coverage which already includes Satellite, graphical SIGMETs, winds aloft, current flight category, and more. ForeFlight 9 is full of features that enhance every phase of flying. Run through checklists with ease and reduce cockpit clutter with ForeFlight Checklist. Glide Advisor™️ helps you locate a safe place to land in the event of engine failure, choose from Light & Dark App Themes for day or night flight, helpful enhancements to Logbook, new SXAR1 integration features, and more. Read on for all the details of the ForeFlight 9 release, now on the App Store! ForeFlight’s integrated checklists keep important safety procedures organized and easily accessible. Your familiar paper checklists are transformed into customizable digital templates allowing you to reduce cockpit clutter and spend less time heads down searching for a particular checklist item. Checklists for every phase of flight are laid out in an interactive, intelligent interface that fits naturally into your flying workflow. Select from one of the predefined templates derived from aircraft POH manuals or create and edit your own customized collection of checklists. Templates are provided for a variety of fixed-wing and rotorcraft models. A template for the IMSAFE pilot checklist is also available, allowing you to efficiently conduct a personal preflight health assessment. To run through a checklist, simply tap an item and a green check mark appears. This visual feedback provides an easy way to pick up exactly where you left off with a quick glance. Tap “Skip” to move past an item; this is especially useful if you don’t move through a checklist from A to Z. If you experience an inflight emergency, tap the emergency button to jump immediately to emergency checklist procedures, saving you time and sparing you the hassle of flipping through a stack of paper procedures. ForeFlight Checklist is a feature of our Basic Plus and Pro Plus subscription plans. Learn more about ForeFlight Checklist at foreflight.com/checklist. Using terrain, GPS data, winds aloft, and your aircraft’s best glide speed and ratio, ForeFlight shapes a glide range ring around your ownship icon on the moving map display. If you lose engine power, Glide Advisor helps you quickly assess your options. Enable Glide Advisor in the Map Settings menu. To enter your aircraft’s glide ratio and best glide speed, tap the Glide Settings field under Glide Performance. Pro Tip: Pair Glide Advisor with Distance Rings to quickly report your position to ATC. For the ultimate inflight situational awareness experience, combine Glide Advisor with ForeFlight’s Synthetic Vision and Hazard Advisor. We continue to make flying at night easier on your vision with the addition of a new Dark App Color Theme. Turn on the Dark App Color Theme in More > Settings to convert the background color throughout the app from white to dark blue. Important information remains easily visible through the use of highlight colors and prominent white text. Combine the Dark App Color Theme with Color Inversion and a Dark Map Theme for a powerful night setting. When viewing your Aircraft list in Logbook, you will now see details including aircraft make/model, category/class, gear type, and total hours in that aircraft. It’s a helpful design detail that provides more visibility into your logbook data and also makes it easier to select the correct aircraft for your flight entry. Tap on any Aircraft to modify profile information or to view and edit any associated entries. Logbook’s color-coded recency tracking now includes support for Certified Flight Instructors. To track your CFI currency, enter your instructor certificate number and expiration date in Logbook’s Qualifications section. You can view or edit your instructor certificate at any time by tapping on the summary in the main Logbook view. Recency tracking in ForeFlight Logbook is the fastest way to visually check the status of all of your currencies in a single spot. Learn more about ForeFlight Logbook at foreflight.com/logbook. ForeFlight’s integration with the SXAR1 Aviation Receiver now includes support for streaming SiriusXM Satellite Radio. Pair your Bluetooth headset or audio device (like your aircraft’s built-in Bluetooth audio system) to the SXAR1 and use the ForeFlight interface to browse and select radio stations. The SXAR1 provides audio to one Bluetooth audio device at a time. The video above will get you started with setup. In addition, SiriusXM’s Surface Wind weather layer is now available. To dive deeper into this new SXAR1 layer, check out this article written by our in-house Weather Scientist, Scott Dennstaedt. Learn more about the SXAR1 and purchase information by visiting foreflight.com/siriusxm. Now you can import custom KML files into ForeFlight. KML (Keyhole Markup Language) is a file format used for geographic data that allows you to import shapes such as points, lines, and polygons into ForeFlight’s Maps view. User Map Shapes are more versatile than simple user waypoints, allowing you to designate specific areas on the map for your custom, navigation needs; flight schools or flying clubs can use User Map Shapes to delineate designated training areas or route lines on the map. Import your KML files into ForeFlight via iTunes sideloading, then display them on the map by enabling them in the layer selector, just like with other map overlays. Watch our video tutorial above to learn more about importing KML files into ForeFlight. In a perfect flying world, the wireless connections we use in the cockpit would never experience issues. But whether from a dead battery, connection issues, or human error, both portable and installed equipment can unexpectedly disconnect. ForeFlight’s new Device Disconnect Alert provides a prominent visual and audio alert that allows you to quickly troubleshoot and restore connection or switch to an alternative data source. This helpful new alert monitors both portable and panel-mounted avionics. You can manage all alerts in ForeFlight in More > Settings > Alerts. ForeFlight Documents now includes support for Microsoft Word, Powerpoint, and Excel files. Import and save your POH, local procedures, common radio frequencies, or any other .docx, .pptx, or .xlsx file for easy access in ForeFlight’s Documents view. Connect your Amazon S3, Dropbox, or Box account to securely deliver document files and updates via the cloud. Import your Microsoft Office documents into ForeFlight via iTunes sideloading, and easily share documents with your friends or fellow pilots with the Send To button. Learn more about ForeFlight Documents at foreflight.com/documents. In ForeFlight Mobile 9.0 we’ve added a high resolution surface wind analysis to the list of map layers you can display through the SiriusXM satellite weather broadcast. This new product includes both windspeed and direction presented as wind barbs similar to the winds aloft layer. Tapping on any wind barb will show the specific details. The surface wind analysis layer broadcast by SiriusXM will provide an overview of the general circulation of the prevailing wind about 10 meters above the surface. Tapping on any wind barb will display the valid time as well as the windspeed and direction at that location. Yes, there will be two surface wind layers when connected to the SXAR1. The layer you have been using in prior releases and the one you can view when connected to the Internet is strictly based on surface observations from the various weather reporting stations around the world (typically airports). This depicts the actual wind reported in the routine observation (METAR) or special observation (SPECI). The surface wind layer is depicted at weather stations as colored wind barbs; at this point in time the wind markers shown include the gust factor. The surface wind layer that is based on observations is shown as wind barbs color-coded based on the observed wind speed at weather stations. The new surface wind analysis layer is not observed data from weather stations, but instead is generated by a forecast model, and therefore, completely automated. It’s only available when connected to the SXAR1 and shows an analysis of the prevailing wind at 10 meters above the surface; it does not include the gust factor. Unlike the observed data that is updated when new observations are taken, the surface wind analysis is updated once every hour. When refreshed, this will provide wind data that will be valid at the top of the previous hour. The surface wind analysis broadcast by SiriusXM shows low level atmospheric circulations very well as seen here as a Nor’easter deepens over the Delmarva Peninsula. The primary value of this new layer is to show low level circulations at the synoptic scale level. This will point out high (clockwise) and low pressure (counter-clockwise) circulations as well as lines of convergence in the vicinity of strong frontal boundaries. This is difficult to see with the coarse network of observing sites throughout the U.S. But with the high resolution surface wind barb analysis, these circulations and convergence zones show up nicely.